OK, so it’s not exactly in downtown Frederick: It’s 4 miles away, in Buckeystown (and in fact, used to be the Inn @ Buckeystown). But it is so worth the 10-minute drive to get here. The exuberant and warm Pat and Kirk Horstman, on a ten- year quest to find the perfect B&B in the perfect “self-sufficient” town, discovered what was a somewhat disheveled place and loved its 1897 “bones.” They completely renovated the place and reopened it in August 2015 as The Frederick Inn B&B. 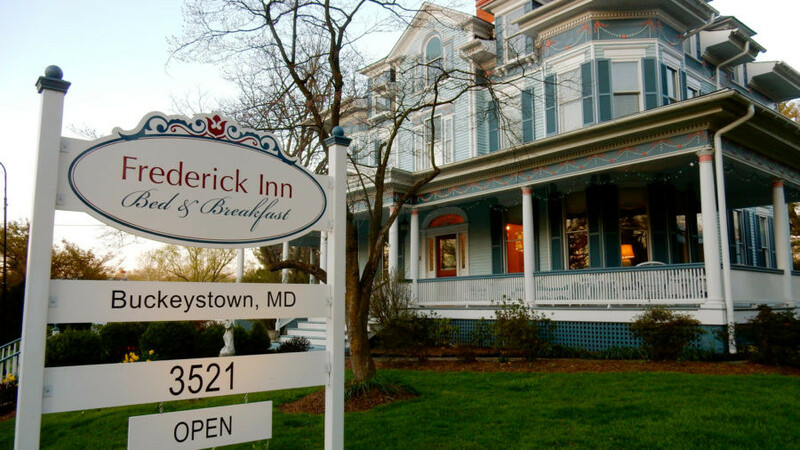 Now, it’s such a true serene escape, we recommend the Frederick Inn B&B for a Honeymoon, Babymoon, Supermoon, Harvest Moon – in fact, for any and all phases of the moon. It is that beautiful. 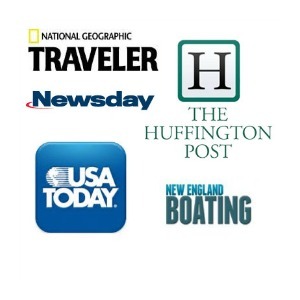 (To get the most out of a stay in greater Frederick, check out THIS POST). From Frederick, I drove through the traffic snarl of a commercial zone, only to find this sweet, bucolic burg and a big blue house on a rise off a tree-lined street. Within minutes, I learned that Pat, formerly “in corporate America,” and Kirk, “an environmental engineer,” lived in Philly, raised three daughters, moved here and were looking forward to this next chapter of their lives. Pat is the outgoing, engaging, huggy side of the couple – Kirk more reticent. But combined, they are wonderful hosts of a first class property. The only thing glittery about the 9 guestrooms here are small crystal chandeliers hanging overhead. Otherwise, these tasteful, spacious accommodations exude contemporary-country comfort. Walls in subtle pastels, trademarked “Comphy Sheets” on dreamy beds, pristine white tiled bathrooms, fast wi-fi, flat screen TVs, and glory-be, electrical outlets atop bed side tables (a huge perk, in my opinion), give each room visual and physical impact. The Horstmans source ingredients from a local CSA, and fresh-roasted Fair-Trade coffee from Miss Mary’s Perfect Roast down the street. So, basically, the marvelous 3-course gourmet breakfast is a farm-to-fork meal. I scarfed down an ethereal raspberry scone, Apple Cinnamon Bake, and Lemon-Ricotta Poppy seed pancakes as light as my very happy mood. Rooms and suites from $159 to $219 include parking, wi-fi, and a three course gourmet breakfast for two.